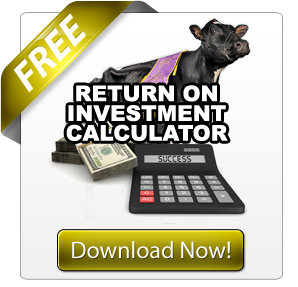 The 2012 Royal Winter Fair Holstein Show – One of the greatest stories ever told! By all accounts Callum McKinven of Canton de Hatley, QC did an outstanding job. He was consistent in the pattern he set and did an outstanding job even going so far as quickly explaining personally to each exhibitor in the class the reasons for their placing. 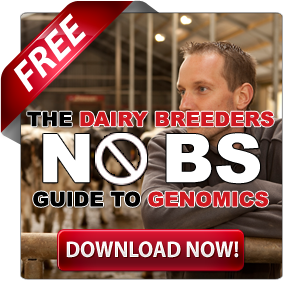 While he didn’t do the “Jimmy Superfly Snuka” slap as the 2012 World Dairy Expo Judge Mike Heath did in naming his champions, Callum did do a great job of explaining the reasons why he went with the winners he chose on this day (Read – World Dairy Expo 2012 Holstein Show – A Battle for the Ages). 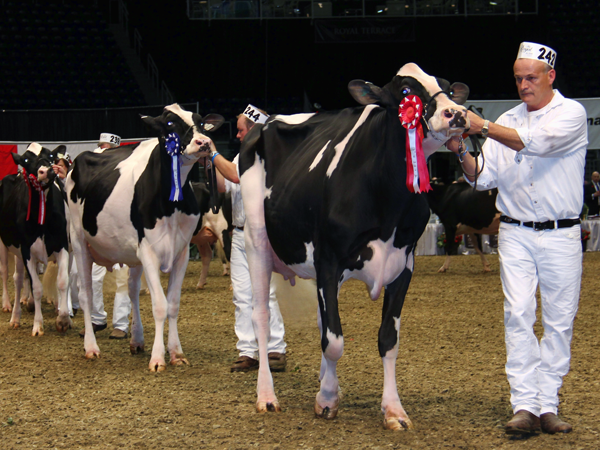 Although his family couldn’t be at ringside when Callum was naming his Grand Champion (they were exhibiting in the Jersey show), Callum had the support of his Holstein family as the perfect judge for the 2012 Royal Winter Fair Holstein Show. Because World Dairy Expo Junior Champion – Lafontaine Aftershock Arrie was not in Toronto we were unable to get a head-to-head matchup between her and MD-Dun-Loafin Lauth Ell. Elli was not at Madison because of being owned by the WDE ‘12 Judge Michael Heath and his associate David Dyment. However, judging by Judge McKinven’s pattern I don’t think that would have changed anything. Ellie looked great and personified just what Callum was looking for. 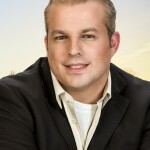 Following Elli were Petitclerc Alexander Amycale from Ferme Jean-Paul Petitclerc, QC for Reserve Junior Champion and Honourable Mention Sharp Acres ST Jessy exhibited by Clarkvalley Holsteins & Ronald C Werry & Casscrest Holsteins, ON. Moving up from her 4th place finish at Madison, Roquet Jasmine Sanchez exhibited by Gen-Com Holstein Ltd., QC end up second not quite able to pull ahead of the outstanding Madison winner BVK Atwood Arianna, owned by Jeff Butler & Frank & Diane Borba & Ponderosa, IL. The first cow class winner of the day, that had not also won in Madison. 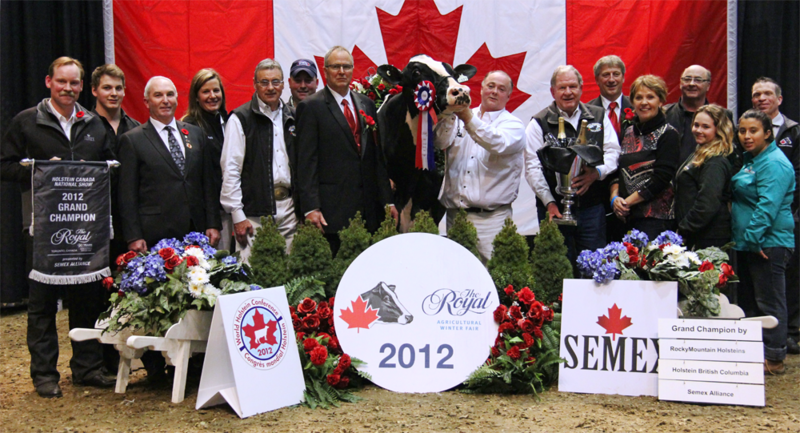 was the winning Jr. 3yr old, Robrook Goldwyn Cameron exhibited by Gen-Com Holstein Ltd., QC. 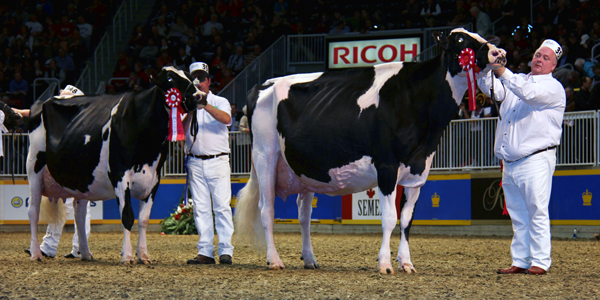 Coming off her win at the recent Quebec International Show (Read more – Expo International Holstein Quebec Results) Cameron looked amazing. Following closely behind her was the 2nd place Madison winner Blondin Goldwyn Subliminal exhibited by Budjon Farms & Peter Vail, WI. Continuing her dominance was Cookview Goldwyn Monique exhibited by Jeff Butler & Joe & Amber Price, IL (Read…Butler article) in the Senior 3 year old class. Monique’s frame and capacity and fore udder were just too much for Dubeau Jasper December exhibited by Gen-Com Holsteins Ltd., QC. Monique went on to be named Intermediate Champion followed by the 1st place Junior 3 year old Robrook Goldwyn Cameron and then the 1st place Senior 2yr old Butz-Butler Gold Barbara. The 4-year-old class was won by the recently scored EX-94-CAN Macpes Fortune Koquine exhibited by Marcel Martin & Real Belanger, QC. Placing second was Bourgival Goldwyn Oriel (Goldwyn), Pierre Boulet, QC (Read – New 1st Time Excellents in Canada Over 92 Points). Following her was Eby016 PSS Trinity (Sep. Storm) exhibited by Pleasant Nook Farm, Ayr ON who were just starting what was to become one of the most memorable days of their lives. Wendon Goldwyn Allie exhibited by Ferme Laitiere Rayon D’Or, QC continued her dominance of the 5yr old class and using her outstanding mammary system to edge out Bonaccueil Maya Goldwyn exhibited by Drolet & Fils & Ferme Jacobs Inc. & Ty-D Holsteins & A&R Boulet Inc., QC. 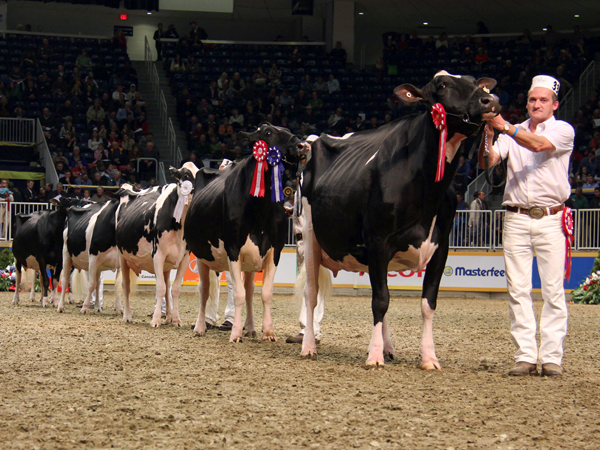 In what turned out to be a much closer class than many expected, RF Goldwyn Hailey exhibited by Gen-Com Holsteins, QC, finally got the run for her money that many anticipated she would get at Madison, but didn’t foresee happening here at the Royal (Read – Who’s Next? 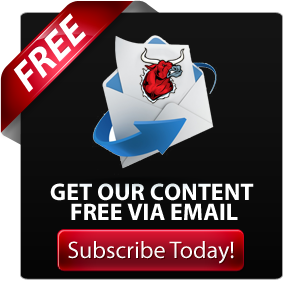 World Dairy Expo Holstein Show Preview). 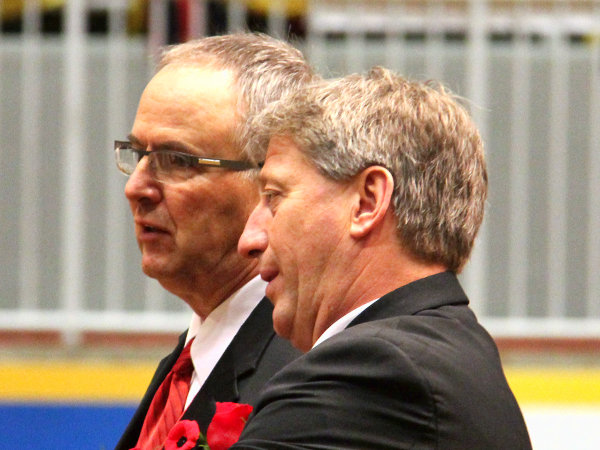 Stepping up to the plate to give Hailey the battle was Ebyholme Goldwyn Marcia exhibited by Brian Eby & Pleasant Nook Holsteins, ON. In his reasons, Judge McKinven explained just how close the battle was and foreshadowed things to come. 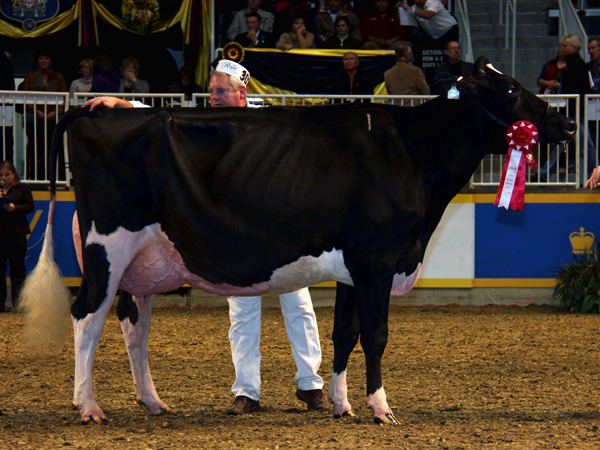 Starbrite Lyster Lyndsay exhibited by Starbrite Holsteins & Hodglynn Holsteins, ON continued to build fans as this now 9-year-old cow won the Longtime Production Class. Lyndsay was followed by Goldenflo Lheros Bubble Gum exhibited by Pierre Boulet, QC who was 5th at Madison. In naming RF Goldwyn Hailey Senior and Grand Champion, Judge McKinven really didn’t surprise anyone. Where he did surprise everyone was in naming the 2nd place Mature Cow Ebyholme Goldwyn Marcia for his reserve. Ebyholme Farms sold out this summer and Marcia was purchased by Brian’s son Rob and his wife Julie, for their Pleasant Nook Holsteins. (Read – Ebyholme – The End of an Era). I can still remember at the sale Jeff Stephens (2012 Royal Winter Fair Jersey Show Judge) saying “Hey if someone was looking for a cow that will give you a little excitement this fall, Marcia could be the one.” He then placed a phone call and was the contending bid on Marcia that day. Ebyholme are three time Master Breeders and at the time of their sale, I lamented that this could be the last time we would hear the Ebyholme name. While I was sure that the talents of Rob and Julie would continue to great things, no one could have predicted what was to come so soon. Well no one but Rob, Julie and the crew who have become more like family for Rob and Julie then just friends. 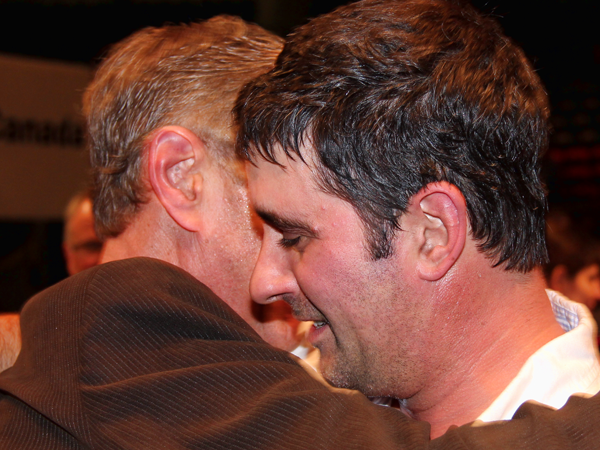 After the show, in talking with Greg McLean, longtime friend of Rob’s and key crewmember, you could see the emotion on his face that had also been so evident on Rob’s in the ring. Probably the most touching moment I have ever witnessed at the Royal was when Brian made his way into the show ring to congratulate and embrace his son. Watching those two, and then Julie, smiling and hugging through their tears, created one of those “Royal” moments that will forever touch our hearts. 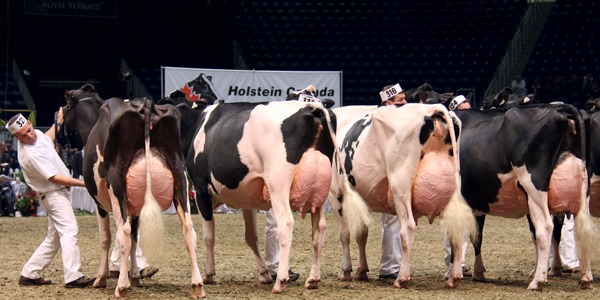 While the class headliners may not have looked that much different from Madison, the story behind the results from the 2012 Royal Winter Fair Holstein Show was truly amazing on all levels and for me one of the greatest stories ever told. Someone should make a movie out of it.